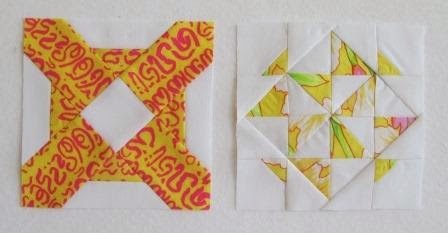 I have 2 Dear Jane blocks done so far. The left one is D-7 Meeting place. 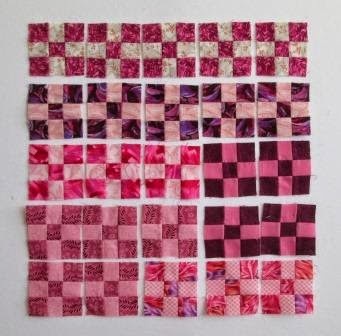 Without realizing it I picked to do this block with a fabric called Babble. Meeting Place and Babble, kind of funny. The right block is A-1 Pinwheel Gone Awry. I had this last bit of pink to finish up. 25 nine patches to put with all the other nine patches. 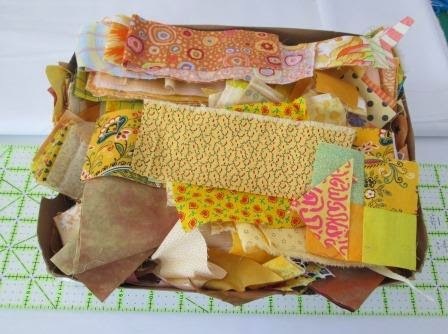 Here is my box of yellow scraps. It is one of my smaller boxes but I still have lots to work with. I have a far bit of yellow to do this month, so here is a list. 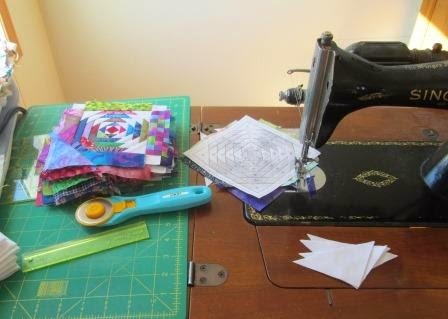 I really must get a quilt top or 2 done soon. The 2 quilt guilds I belong to have quilt shows later this year. I have not finished anything new for a while. I have my Pineapple log cabin blocks out today. I am very close to being done the next set of 27 blocks. Why 27 you may ask, well it turns out I can get 27 units of 1 strip of the red fabric I use in the center. 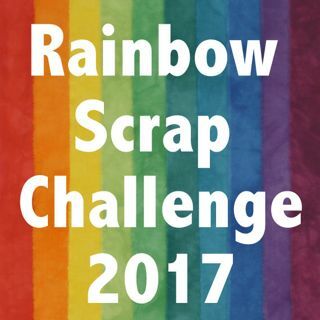 I have added today's post to Soscrappy's Linky Page for the Rainbow Scrap Challenge 2015. Love the peep of your Pineapple log cabin blocks! It's good to have a plan. Good luck in accomplishing it. Pineapple and Dear Jane? Impressive. But I'm especially impressed that you've taught your yellow scraps to align themselves so neatly in a box. What a great slew of projects. Enjoy playing with yellow- you have even more projects on that go than me! Can't wait to see the apple cores. I agree your DJ blocks are pretty. I must try making some pineapple blocks sometime. I always love how pretty they are. Meeting Place and Babble (giggling). I, too, need to assemble my RSC tops from the blocks made last year . . . all in good time! Love your DJ blocks. Yes, Meeting Place and Babble is funny!! Good luck with your goals. Looks like a long list if you ask me. Great additions to your DJ quilt. Slowly but surely it is coming along. Looks like lots of yellow plans to keep you busy for the rest of the month. You have several exciting projects on going. You go girl! I'm learning from those of you who have participated in previous RSC's. I've got to make a list of the various blocks I can make each month!